Previously, Facebook had been driving huge numbers of installs and re-engagements to news reader apps with a “recently read articles” box that would often appear at the top of the news feed. But in mid-April following a massive reader app user count spike it replaced this with a redesigned “trending articles” box that shows fewer articles, and that seems to appear less prominently. The transition period where Facebook may not have been showing any “recently read article” box is likely to blame for the decline, along with a leveling off from the spike and reduced traffic from a weaker “trending articles” design. What the these user count fluctuations really mean is that Facebook is in firm control of what apps and content types receive traffic from its news feed. It can dial up and down the presence of anything, be that photos, games, news readers, or most recently Open Graph video apps like Viddy and SocialCam. This should signal to entrepreneurs and VCs that you can’t build a type of product, or invest in one, just because it’s doing well on Facebook right now. 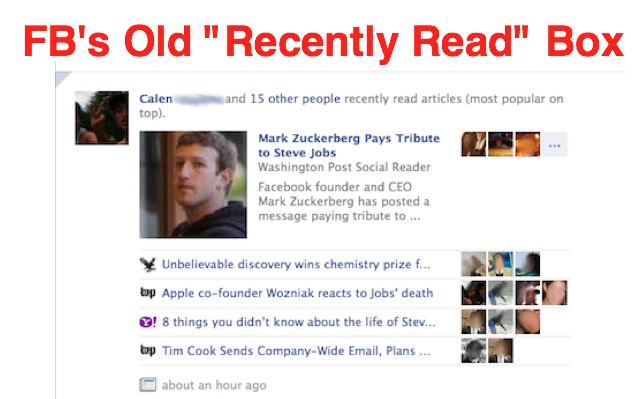 Facebook is looking for the most engaging way to show you the articles your friends have read. The first version screenpic’d above appeared from September to April, and was often seen at the top of the news feed. While great at driving traffic, it didn’t show a picture or blurb for most articles and may therefore have incentivized sensational headlines. The new version seen below only shows one article at a time, often appears buried many folds down the news feed, and its large thumbnail images and lack of friend’s faces make it seem foreign. The recent decline in social readers may be due to this version driving less clicks per impression, or Facebook simply displaying it less frequently than the old one. It’s also crucial to note that something caused a massive spike in social reader user counts in early April, according to application growth tracking service AppData. Much of the social reader user count loss cited by BuzzFeed and Forbes is actually just the leveling out of that spike, which may have also been due to news feed changes. These publications couldn’t see the spike because apparently they don’t have AppData Pro accounts that show an app’s whole user count history, not just the last 30 days. The spike appears even more sudden because a Facebook data reporting error lumped multiple days-worth of growth into April 10th. The decline from April 11th to April 16th may have been due to Facebook showing no form of the “trending articles” box, and the modest growth starting on April 17th may have been to the new version starting to appear. Similar user count fluctuations to those that The Guardian also impacted The Washington Post, The Independent, and many other apps. Regardless of your opinion on auto-sharing, discontent with it wouldn’t manifest as a sudden cross-reader app user count decline. Update: Ryan Kellett, the Engagement Producer for The Washington Post confirms it was news feed changes that led to the decline, not user discontent as purported in BuzzFeed’s article “Facebook Social Readers Are All Collapsing”. Facebook will continue testing new formats in search of one that sends lots of referral traffic, but to high-quality articles. News reader developers should hold tight, talk to their Facebook reps about how changes are hurting user counts, and hope an optimal version of “recently read articles” emerges soon. But just because there was massive organic referral traffic to be had until now is no guarantee it will return. Game developers know this lesson all too well. When Facebook’s app platform launched, it was a virality bonanza for developers because in-app activity prominently appeared in the news feed. Game devs flocked to Facebook, but soon it changed its news feed so game stories would only appear to other gamers. Suddenly, it was much harder to grow organically. You had to have a big marketing budget and apps to cross-promote from, like Zynga, to continue succeeding. Something similar may now be happening to news reader apps. If it was really user discontent with frictionless sharing of reading activities that was causing a decline, it wouldn’t have happened so quickly and distinctly. Different users starting to use the apps at different times would follow their own curves of discontent. They wouldn’t all flee at once. The decline would have also hit other types of auto-sharing apps. It hasn’t. In fact, non-news reader auto-publishing apps that have the same authorization flow have been doing very well. Few signs of serious discontent there. The fact is that Facebook controls the news feed like an editor-in-chief controls a newspaper’s front page. It decides what kinds of content its users see. Just last week you probably noticed news feed stories about friends registering to be organ donors. When Facebook created the option in an effort to save lives, it set the weight of the news feed stories created by the feature to ‘high’ to help increase registrations, and it worked. Many suspected Facebook Deals could be a Groupon-killer because Facebook could set the revenue-earning product to appear constantly in the news feed. It didn’t, though. Facebook likely saw low-engagement with the stories, didn’t want to pollute the feed, and eventually killed off the product. Facebook doesn’t usually meddle with the controls too overtly, and when it does it’s by story type, not to censor or promote certain content topics. Facebook typically looks to create the most enjoyable news feed possible, with increased return visit rates and the ad impressions they drive as a nice side effect. So while the old “recently read articles” section may have secured plenty of clicks for link-bait headlines like “Is Snooki pregnant?”, it may not have been best for the user experience. That’s why it’s gone. Postscript: Plenty of people hate frictionless sharing. Others don’t mind it, and I think it has the potential to power data-driven content discovery and offer useful granularity in sharing — a middle ground between not sharing and explicitly posting a piece of content. It’s an important debate about the future of curation, so write your own blog post response and send it to us, or weigh in on Twitter or our comments.